Seriously Strong Cheddar wanted to articulate that its product is an intense, not strong-tasting, cheese. To change people’s perception of Seriously Strong Cheddar from a ‘strong’ to an ‘intense’ tasting cheddar. To link the brand with the traditional ploughman’s lunch, taking it ‘out of the pub’ and directly to consumers. 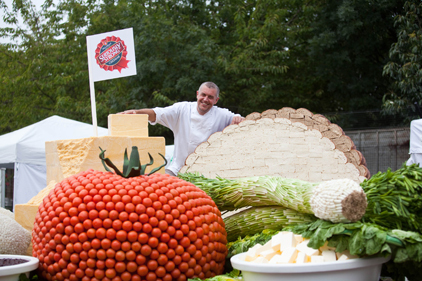 Fleishman-Hillard devised a campaign around a world record attempt for the largest ploughman’s lunch, with the gigantic piece of food art to be displayed at the Foodies Festival in Battersea. Chef Paul Merrett also created a ‘Perfect Ploughman’s’ recipe, while regional suppliers sourced products for the world record attempt. The story was covered by key listings, while the photo-story was featured as picture of the day on Telegraph.co.uk and Metro.co.uk, as well as a full story and image on AOL.com and by 13 regional media outlets. Sampling reached 5,000 Foodies Festival attendees. The largest ploughman’s lunch was officially verified as a Guinness World Record on 26 August.